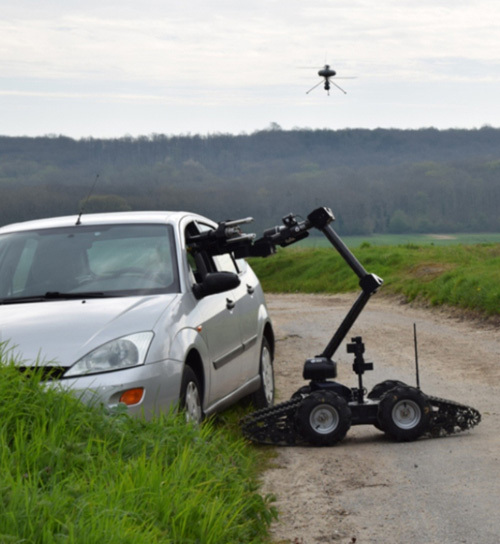 ECA Group recently performed in Paris area several demonstrations of its collaborative concepts of operation composed of Unmanned Aerial & Land Vehicles for stand-off mine clearance. ECA Group demonstrated its new operational concept for IED/EOD missions consisting in a UAV & UGV collaborating together. This collaborative concept is aiming at providing intervention teams a better situational awareness and overwatch for executing Explosive Ordonance Disposal (EOD) and Improvised Explosive Device (IED) missions. The complementarity of the UAV IT180 systems comes especially when the visibility from ground platform (UGV) is limited or when the risk is out of the operator's view. The ECA Group is renowned for its expertise in robotics, automated systems, simulation and industrial processes. Since 1936 it has been developing complete innovative technological solutions to perform complex missions in hostile or restrictive environments.